The Supervisor of Elections has signed the final National Results Tally and handed it over to the Electoral Commission. 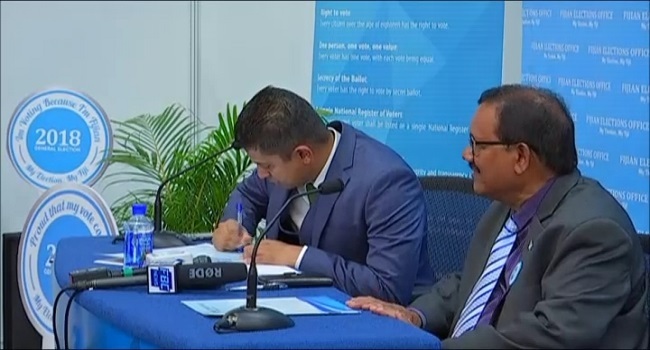 Electoral Commission chair Suresh Chandra and his commissioners are now doing the seat allocation for parliament. Following this the Electoral Commission chair will return the Writ of Election to President Major General Retired Jioji Konrote. He is expected to do this in the next half an hour at the Grand Pacific Hotel in Suva. While receiving the National Results Tally Chandra also thanked the Supervisor of Elections and his staff for a job well done.